This race recap is very late, but better late than never. 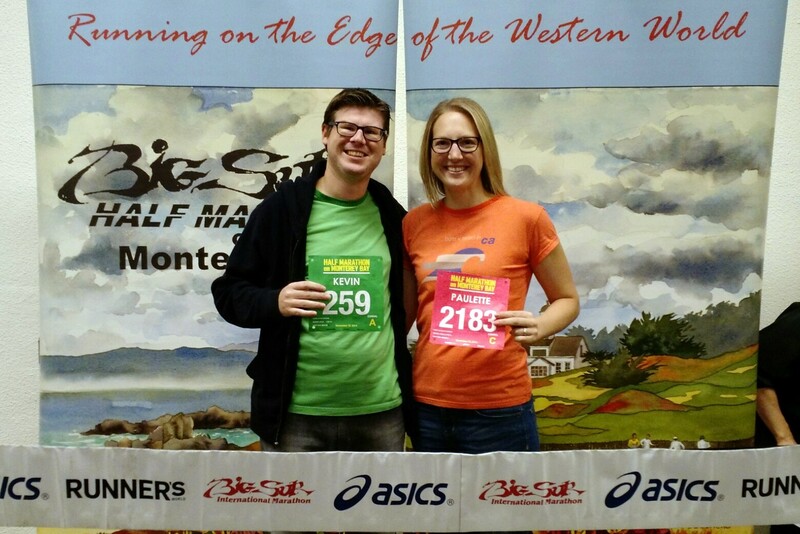 On November 16, 2014, we visited Monterey to run the Big Sur Half Marathon along Monterey Bay. It was my second time running this event (the first time was in 2012) and I absolutely love the course. Our friend Mandy was visiting from Ohio to run it, so Kevin and I both signed up too. 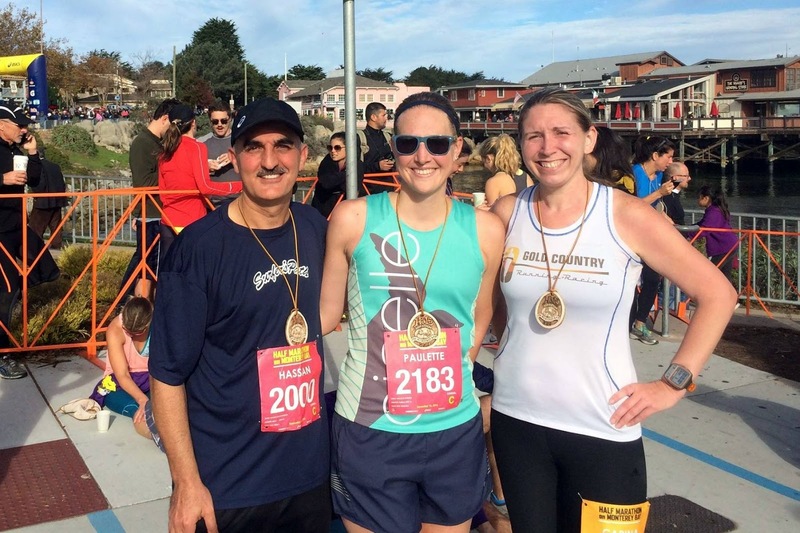 Running a half only two weeks post-marathon was not my best decision ever, but I managed. That said, I won't be trying that again anytime soon. We drove down to Monterey after dinner on Friday and spent the weekend at the Monterey Bay Marriott, which was the host hotel. That hotel is about a 5 minute walk to the start and is basically at the finish line, so it's very convenient for the race. 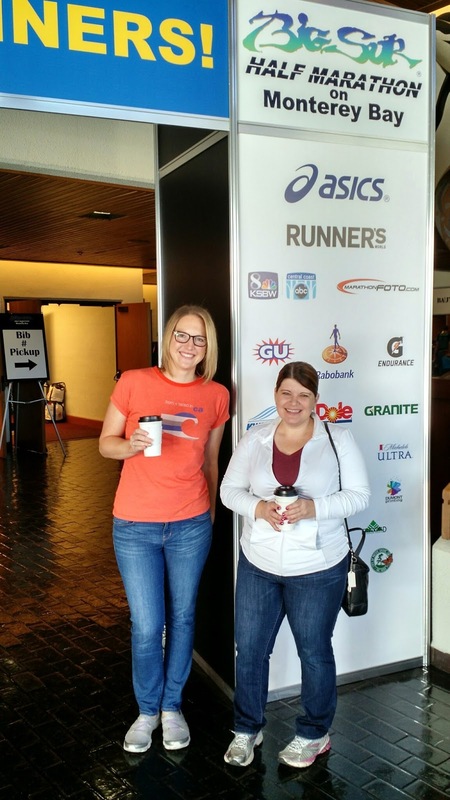 On Saturday morning we grabbed breakfast sandwiches and coffee at Plumes Coffee House (we are big fans of that place) and then headed over to the race expo around 11 am. Packet pick up was quick and easy, I'd say less than 10 minutes total to get everything. 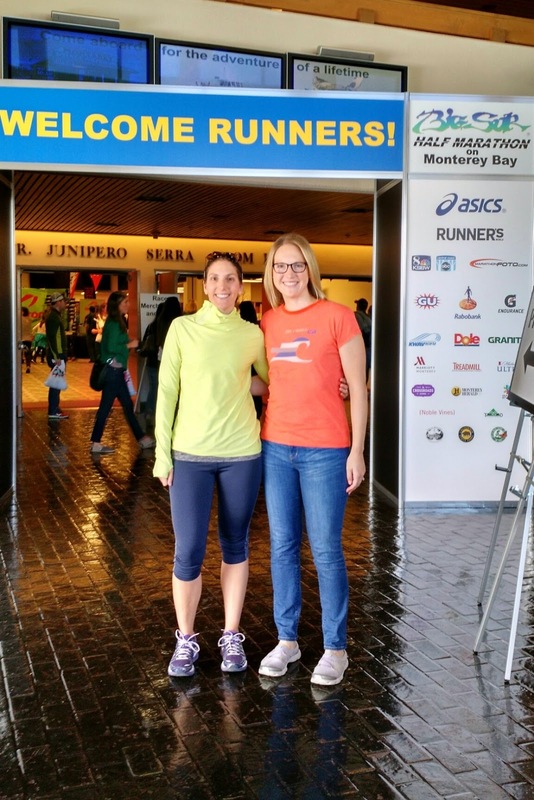 We wandered around the expo for a while and enjoyed the booths, and I also had a chance to meet Marilyn (Oiselle flock runner) who was visiting from Seattle. With Mandy at the expo entrance. Excited to meet and chat with Marilyn! The rest of our day included a trip to Carmel for wine tasting at Wrath and Manzoni and cheese tasting at The Cheese Shop. Those are our can't-miss stops when in the area. We had a late lunch at 400 degrees in Carmel and spent the rest of the evening relaxing at the hotel. It was a fantastic day. 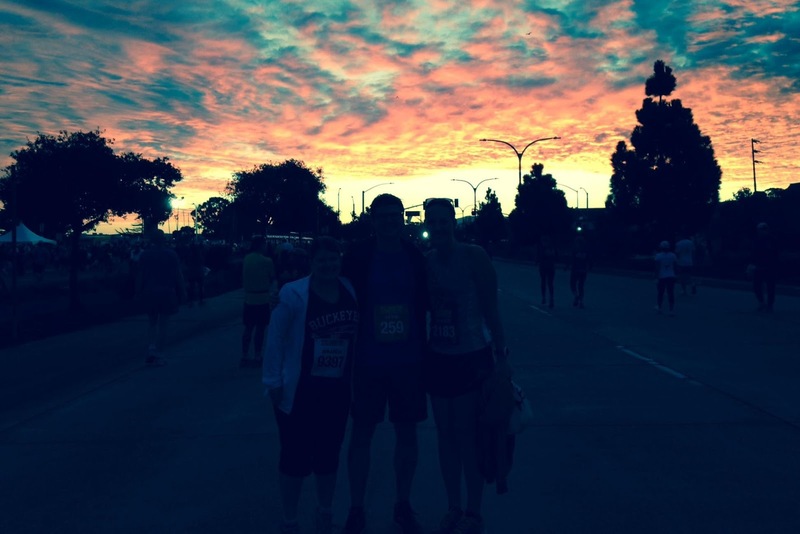 We woke up early on Sunday for the 6:50 am race start and enjoyed the easy walk to the staging area. The sky was beautiful that morning and the weather was perfect. Kevin and Mandy went to their start corrals, and I went to the front to watch the elite start. After the elites went off and I cheered for the Oiselle ladies Megan and Kara, I jogged back to the C start corral just in time to chase them across the start line. I knew before the race that this would be tough because my legs were not fully recovered from New York. I tried to take it easy and to told myself I could manage a half distance even feeling like crap. Luckily, Carina (who I met through Alisyn) came running up behind me and chatted with me for quite a few miles. 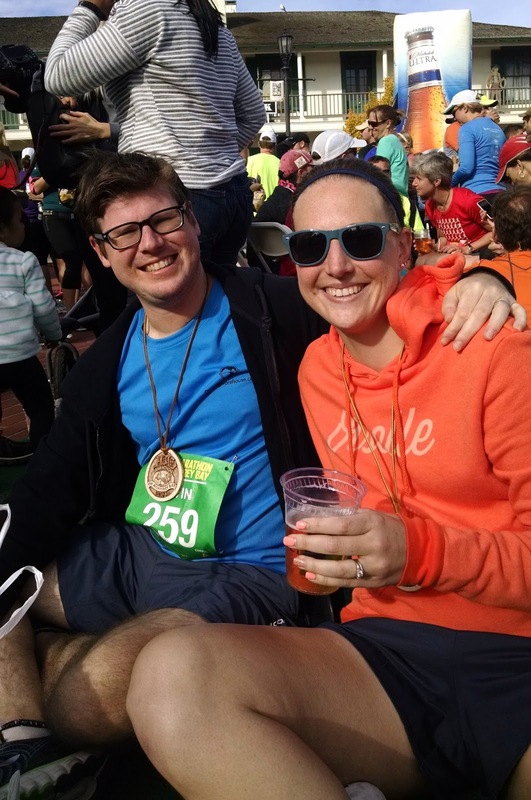 She kept me going as much as was possible, but by the time I hit mile 6 my legs felt dead and I told her to go ahead. I expected to do a lot of walk/run miles after that point, although I didn't end up needing it. 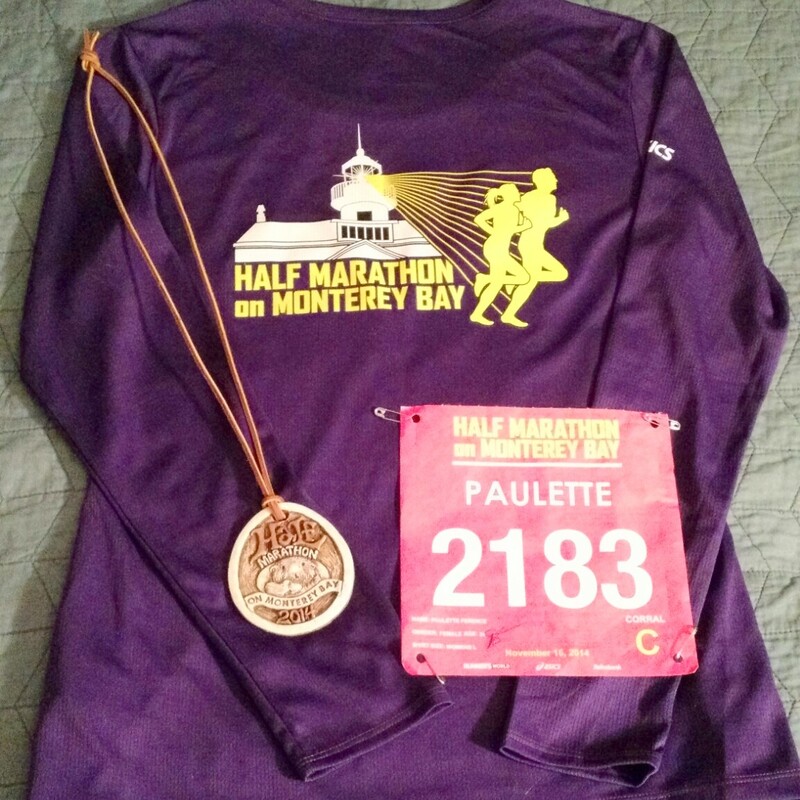 The majority of this race is run along Monterey Bay, which is beautiful and makes for a great mental distraction. The course rolls up and down, never steep, so it's perfect for my taste. I said hi to friends during the out and back section, another welcome distraction and fun part of this event. I saw Kara, Megan, Meg (who had an awesome PR), Kevin, Carina, Marilyn, and Mandy. Aside for a couple of short walk breaks to stretch my calves and to get my legs back in the game, I ended up doing ok and finished in 2:11:03. After crossing the finish I met up with Carina again and then we found Hassan. We talked for a while until I decided I should go find Kevin - who by this point had been waiting on me for at least 30 minutes. Oops. By the time I actually found him, he'd already had a beer. The finish area for Big Sur Half is really nice, complete with free beer, hot soup, cookies, and a live band. Kevin and I watched the awards ceremony because Kara took 2nd female and qualified for the Olympic Trials Marathon - so awesome! I was happy to be able to talk to both Megan and Kara for a bit after the awards. 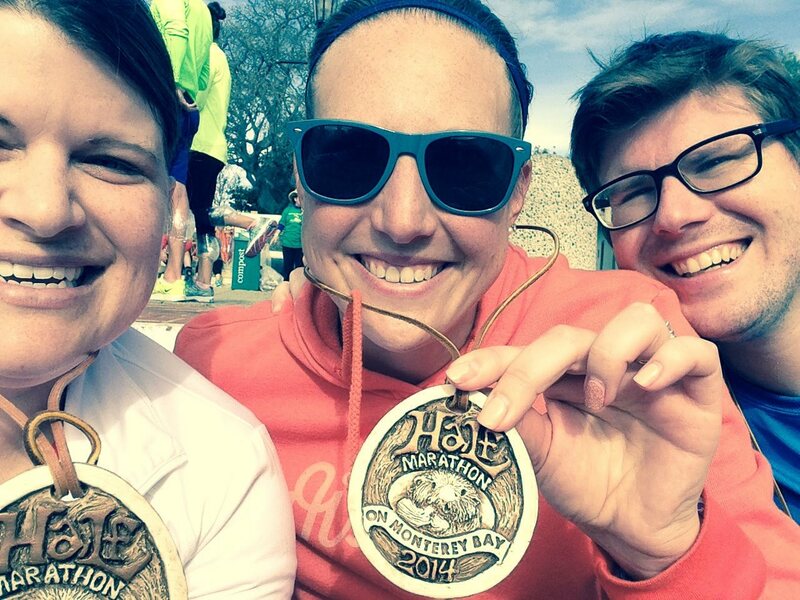 When Mandy finished, we found her and hung out for a little longer at the finish area. Sadly we had to head to the hotel to check out and drive back to San Jose, leaving the magic of Monterey behind. Hanging out and listening to the band. The Expo. The expo for this race is pretty big, and they have many booths for other races and for merchandise. I enjoyed talking to the guy at the CIM booth, who was ready to recruit me to staff it for saying great things about CIM. We didn't purchase anything, although the t-shirts for the Big Sur Half were really cute. Getting bibs and race shirts was very easy and there was no line when we were there. I also liked how the bibs were different colors for each start corral. Cute purple shirt for women, navy blue for men. 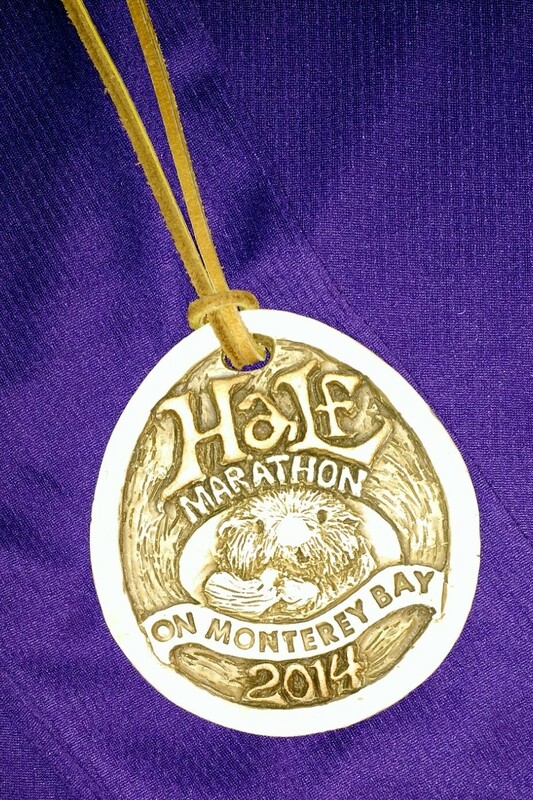 Close-up of the ceramic medal. The animal changes every year. Love them! The Course. The course is gorgeous. It has little rolling hills that give the leg muscles variety. The majority of the course is an out and back section along the bay and part goes through Pacific Grove. By the time you turn around at Asilomar State Beach, you are more than halfway done. One thing to note is that this course isn't actually near Big Sur as the April marathon is, and I think that confuses people. It's the same race organization but a completely different course. The Support. Course support was great; there were plenty of water stations and they provided Gu gels two times along the way. There were a lot of porta-potties at the start area, and they were spread out near different start corrals. I waited in line at the first group we found and later realized I could have walked right into the ones near the front corrals. Gear check was also very easy and they had trucks stationed at varying locations along the start corrals. When I went to grab my gear bag at the end, they had it in my hands by the time I made it up to the gate. Impressive! The Finish Line. They had a great finish line area and tons of food. Runners were given: bagels, cookies, tons of fresh fruit from the local area (grapes, strawberries, bananas), pretzels, chocolate milk, protein shakes, hot minestrone soup, gatorade, water...and likely things I can't remember now. We had three beer options too: Stella Artois, Shock Top, and Michelob Ultra. The band was really fun and played 90s music. I loved the atmosphere. Overall, this is a very organized, fun event and I highly recommend it! I love this race. I only did it once before but want to do it again. I may have to make it my goal race for next year ;) I didn't know the animal changed on the medals! How cute. I think I got a seal on mine. I'll have to check. And a 2:11 half 2 weeks after a marathon is pretty damn admirable in my opinion. Way to go!